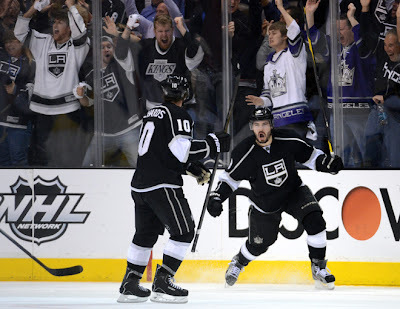 The Sin Bin Sports Blog: Will Early Start Time Hurt The Kings? Will Early Start Time Hurt The Kings? The Los Angeles Kings had never held a 3-0 series lead before this season. They now have held 3-0 series leads in both rounds of this year's playoffs. The Kings will have the opportunity to eliminate the St. Louis Blues in the fourth game of their series tomorrow afternoon. However, one factor about tomorrow's game may hinder the Kings' probability of sweeping the West's number two seed. Rather than puck drop being at the usuall 7 p.m. or 7:30 p.m. start time, the Kings will have a rare noon start time. Over the course of the regular the season the Kings only played four games with a start time of 1 p.m. PST or earlier, not including the Kings' opening two games in Europe due to the circumstances of those games. Kings games and results for games starting at 1 p.m. or before is displayed in the table below. That is an 0-4 record, and a .75 goals per game average over those four games, that included some low end opponents. Honestly, one goal in two games against the Blue Jackets and Islanders is a little sad. In the four games the Kings got goals by Mike Richards, Dustin Penner, and Andrei Loktionov. Of course two of those games were before Darryl Sutter had the reigns, and all were before offensive catalyst Jeff Carter was in the line-up so now will be a perfect time for the Kings to change the trend. The Kings will have to shake off the morning jitters if they want to be the first team to punch their ticket for the Conference Finals. Closing out this series as soon as possible can only benefit the Kings with a prolonged period for rest, and the Kings don't want to open the window for the Blues.